This is my first time seeing this one. This is a classic style sword and sandal film. These type of films are an acquired taste. I am a fan of these types of films so in the end I enjoyed this movie. That does not mean everyone will enjoy. This is not a great movie by any means, there are very dull moments, and the film seems flawed in many ways, but with that said the movie is still a worthy film to watch and own. It had a fantastic cast, and an amazing director. I have always been fascinated with warriors, gladiators, strong men, rulers, and so on. This as you would guess deals with the King Alexander the Great played by the wonderful Richard Burton. Burton was a god and total controller of these type of films. From the classic 1953’s The Robe, to 1961’s Camelot, 1963’s Cleopatra, he was and is someone I thought shinned in ever role he ever did. Burton is what I call a manly man actor. He was sophisticated and to the point, and made you believe his characters on screen. He died way to soon, 58 years old was a true shame. Twilight Time has also released some of his other films such as 1984 (which you can read my review for it HERE) and also 1977’s Equus. Robert Rossen, wrote, produced and directed this film. Rossen is someone I absolutely love. He was a guru of film. He had his whole being in creating films. He was so much more than just a director. He wrote, produced and directed many shinning pieces of cinema including the one he is probably most known for, the 1949 masterpiece classic All the King’s Men. His ability to create a film and have it stand out, remembered, and talked about was his way of uniqueness. All the King’s Men garnered Best Picture, Best Actor, Best Supporting Actress wins and rightly deserved each one of those awards from the Oscars. He also directed the one of kind classic The Hustler starring the amazing Paul Newman which was nominated for 9 Oscars. His last film was 1964’s Lilith. Like Richard Burton he died way to soon. Only 57 years old. He had such a golden talent of creating thought provoking storylines, and executing his performers in award worthy roles. 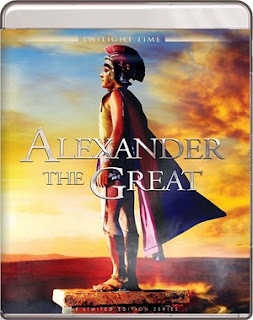 Alexander the Great is not a great film, it’s not worthy of a lot of praise, but it is a shining example of an epic film, starring amazing talent. As I have stated, the film has a wonderful cast of performers. The amazing Fredric March who will always be the original Dr. Jekyll and Mr. Hyde (1931). Harry Andrews who was truly a unique performer that had a memorable look about him, he was massively squared jawed which made you remember his face. He was one of the unique character actors that stood out. Stanley Baker who starred in many memorable films including 1961’s classic The Guns of Navarone, 1964’s ZULU and a personal favorite of mine from my all-time favorite Italian horror director Lucio Fulci, 1971’s A Lizard in a Woman’s Skin. Alexander the Great also stars the very beautiful and amazing Danielle Darrieux, who might I add started acting in 1931 and acted all the way up to 2010. This movie has a wonderful array of so many flawless actors and actresses. Also I have to mention this has the wonderful, all around master actor Peter Cushing as General Memnon. I grew up with Peter Cushing’s horror films and he has always been a part of my movie loving life, it was great seeing him in this, outside his typical horror movies. I have never seen this before so I can’t compare it to anything but what I can see Twilight Time did a great job. There is some grain, which does stand out, that is really the only flaw in the video reality. But for it's age this looks fantastic. At times the imagery is vibrant and spot on. The sound is crisp and clarity to the ears. Even with the minor grain, Twilight Time did it again with a powerful new outlet and product to an older movie. Isolated Music & Effects Track. The music was created and flawlessly executed by music master Mario Nascimbene. He was one of the greatest soundtrack composers to ever grace Hollywood. One only has to look at his vast career and his ultimate excellence in sound. He, in his wonderful career gave music to over 150 movies, which is unbelievable in the reality of this composer and Conductor. He also was honored on another Twilight Time release Solomon and Sheba (which you can read my review HERE). Alexander the Great is no different than all his other masterpieces of ear listening, perfection. His music is the style that grabs you and sends you into the movie, and expresses the emotions, or reality taking place on screen. Simply put, his music comes to life as a living being. Claire Bloom on Alexander the Great. The actress talks about the role and the film. A great listen for any movie lover. This is not a great film or one to put in the category of masterpiece, but it still is a picture worthy to own and see, and now is a must own on this beautiful new product by Twilight Time. Alexander the Great is a classic sword and sandal flick of the olden days of movie making. It has a wonderful cast of actors and actresses. The audio and video is stunning. This is a good film to journey back when these epic style sword and sandal films where all the craze. Twilight Time has done another lovely job in creating another wonderful transfer to Blu-ray. Recommended for diehard classic movie lovers.